Paris is a city of luxury, art, history and, of course, light. There’s so much to see and for first time visitors, choosing an itinerary can be daunting. Despite having traveled extensively, Paris had eluded me until recently—l’m one of those rare people who visited Antarctica before making it to Paris. When I finally had the opportunity to explore the City of Lights, my time was limited. Even so, I was able to see the most iconic sights, experience a touch of luxury, delve into history and sample the fabulous cuisine. Here are a few of my tips for making your first (or any) visit to Paris less overwhelming. Taking a walking tour with a private guide is an excellent way to get to know any city. Most guides will meet you at your hotel and walk you through the surrounding area. With an abundance of history, culture and cuisine throughout Paris, each neighborhood will provide unique insight into this beloved city. Walking through the city with your guide is the ideal time to ask where the locals go to eat, play and shop. Locals always know how to find the best places at the best prices. By avoiding tourist laden restaurants and shops, you’ll have a more authentic Parisian experience and save money too. Just like no first time visit to New York City is complete without checking out Times Square, the Empire State Building and the Statue of Liberty, no visit first-time visit to Paris is complete without seeing the Eiffel Tower, Notre Dame Cathedral and the Louvre Museum. And you’re definitely going to want to stroll alongside the Seine River. Consider purchasing the Paris Pass. Available for a single day or for multiple days, the passes provide entrance to the top tourist attractions and often include the option to bypass the long lines. 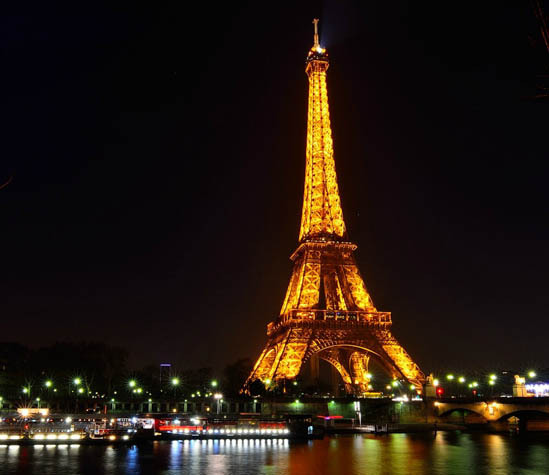 The passes also offer an option for a river cruise on the Seine which provides a unique perspective on the City of Lights. But even with the pass, top attractions are going to be crowded. Consider skipping the hours-long wait to get to the top of the Eiffel Tower for a view overlooking the city. Instead head to the top of the Arc de Triomphe. From there you’ll also have a view overlooking the city and a view of the one thing you can’t see from the Eiffel Tower—the Eiffel Tower. And while the Louvre is a museum you don’t want to miss, it’s important to realize you can’t see it all unless you’re staying for days and doing nothing else. Do your research beforehand and plan a strategy to see the works that are most important to you. If those works include the Mona Lisa, get there when the museum opens before the crowds have a chance to grow or consider going later in the day just before the museum closes. I’m the worst when it comes to learning a new language. My slightly Southern accent usually results in unintelligible jabbering. But, I do try to learn at least a few phrases just so the locals will know I’m trying. In France it’s particularly important to learn these three things: bonjour (hello), merci (thank you) and pardon (excuse me). When you enter a shop or restaurant greet the proprietor with bonjour. Always say merci, and if you’re in the way or need to get around someone, pardon is your go to word. A little effort goes a long way in earning the respect of the French locals. I love nothing more than wandering about an unfamiliar city far from tourist attractions and happening upon local cafes, shops and obscure sights. But for my first visit to Paris, I wanted to be at the center of everything—a place where I could walk to everything I intended to see. By staying in Place Vendome in the city’s 1st arrondissement, I positioned myself in one of Paris’ most chic districts at the heart of the city. It was an ideal spot for strolls down the Champs-Élysées, picnics at the Tuileries Garden, afternoons exploring the Louvre and an abundance of luxury shopping. There are numerous luxury hotels in the heart of the city, but if you’re working with budget constraints, consider renting a furnished apartment which can be found to suit every budget and taste. You’ll feel like a local in no time—and you won’t have to eat out for every meal. But remember, location is key. If you want to be close to the top attractions, opt for an apartment in a single-digit arrondissement or an apartment close to a Metro station. Whatever you do, don’t choose a chain hotel away from the city center. You may score a better rate, but you’ll spend much of your time commuting in and out of the city center. Paris delivers special memories in abundance—and sometimes those memories are worth the expense. If shopping is your thing, go find that fashion label you’ve been eyeing. If you’re a committed foodie, book a table at one of the many Michelin-Starred restaurants. Satisfy your sweet tooth with macarons from Pierre Hermé, éclairs from L’Éclair de Génie, or hot chocolate at Angelina. Or, if you’re all about ambiance like me, hire a car to drive through the city at midnight after the majority of tourists are tucked into bed. As my driver chauffeured me to the Louvre, the Notre Dame Cathedral, down Champs-Elysées to the Arc de Triomphe, and ultimately to the base of the Eiffel Tower, I knew I had found that one special memory I would treasure forever. I had seen Paris at its most lovely—illuminated in tens of thousands of sparking lights. It was pure magic. Have you been to Paris? What was your favorite moment?